Imagine yourself traveling over dry arid plains inhabited with a large variety of wildlife. 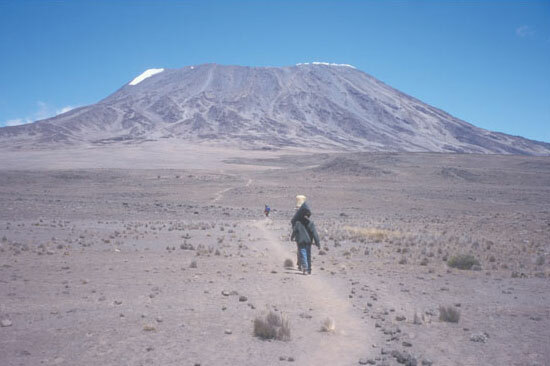 Everything is flat, not a hill in site, until…Kilimanjaro. 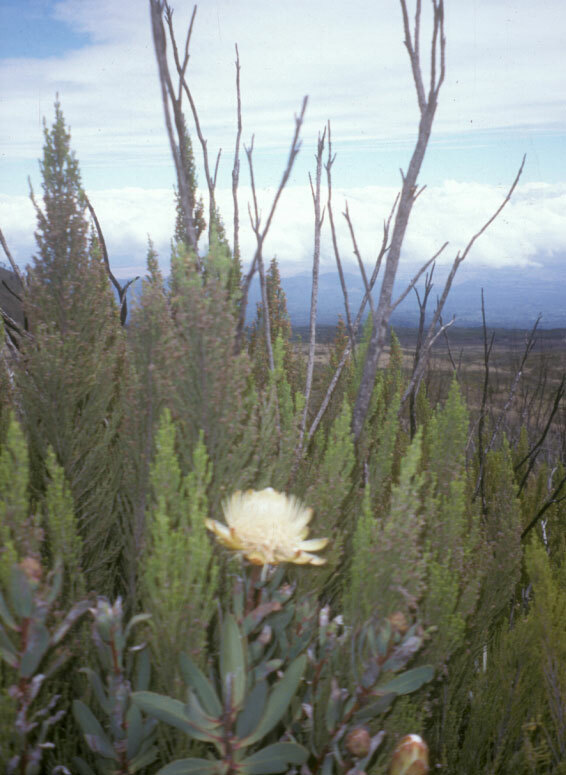 Considered one of the world’s most massive, extinct volcanoes, Kilimanjaro is a mountain all its’ own. With a vertical gain from the plains to the Summit of over 15,000ft, Kilimanjaro seems almost monstrous. It is no wonder why some tribesman don’t believe anyone has actually been to the summit of this massive mountain. With this huge elevation gain, a trek towards the summit of Kilimanjaro exposes one to a great number of ecosystems. From the dry scrubland to the alpine tundra, this makes for a very interesting expedition. Arrive Nairobi transfer to hotel. We will board a private bus, which will take us to Loitokitok (4-5 hr drive) Spend night in cottages. We will continue our drive to the Kenya/Tanzania border; after clearance with Kenyan customs we will continue a further 2k to Rongai starting point of our climb (2100m). After we meet our mountain crew we will start our trek through a natural rain forest where we might be able to see some Colobus monkeys. Our first night will be spent in tens near the 1st cave. Today we will walk through Moorland to the Kilelelwa caves (3600m). 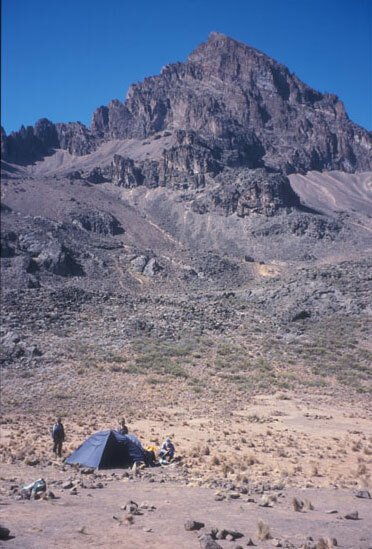 This trek will take us approximately 6hrs w/ lunch break at 2nd caves 3300m/ overnight in tents. We will make our way towards the Mawenzi Tarn hut 4330m. The Tarn hut enjoys views of Kibo (Kilimanjaro). If there is enough time left in the day after arriving at the Tarn hut we will perhaps climb Hans Meyer peak 5149m, which is a slightly technical peak and involves rock climbing. The night is spent in tents. Rest and acclimatization day at the Mawenzi Tarn Hut We can explore and rest before attempting the summit climb. Hike to School Hut (4750m) Snow Cap Mountaineering and Kibo Slopes Safaris have renovated this hut. This trek will take approximately 6hrs to walk through alpine dessert. The terrain is mainly scree and stones. Ascent Day – We will have to rise very early today. We will start at 1:30am. Our path leads us to Gillman’s point (5685m). From here we will be able to watch the sunrise over the glacier field s of Kilimanjaro. We will then proceed to the summit (5895m) and arrive at the summit around 9AM. After enjoying the summit and taking lots of pictures we will then descend to Kibo hut for lunch and then to Horombo hut (3720m). Here we will spend the night. This will be our final day on the mountain. After meeting up with our transport we will transfer to the Aishi Hotel..
We will start our Safari by driving to Ngorongoro via Manyara. The night will be spent in the Ngorongoro Wildlife Lodge. We will visit Masi tribes and explore the game parks along the way. Early morning Safari Late night departure out of Nairobi.